"I was playing with it like little kids do," Victor Pratt said from a hospital, through cheeks swollen nearly shut. Victor Pratt and a rattlesnake, moments before calamity. "You cut the heads off. They taste just like chicken," he said, a mic clipped to his hospital gown - a bit hard to understand because his face had swollen up. It was at his son's birthday party near Coolidge, outside Phoenix, he told NBC 12. They were at a lake. A rattlesnake happened along, as snakes tend to. "I showed them how to catch it and I was playing with it like little kids do," Pratt told Fox 10. "I was showing off," he admitted. "Like I always do." A close-up showed the snake's fanged agape mouth, just inches from Pratt's faded print T-shirt. Except, not pictured, it got loose before that point in the party, and went right for Pratt's face. "I kept my mind strong," he told Fox 10. His sons drove him to a nearby emergency room, where a doctor quickly inserted a tube in his airway to keep him breathing as the poison swelled his flesh. "There is a 100 percent chance he would have died if he'd not have made it to the hospital within minutes," said Steven Curry, who directs the department of medical toxicology at Banner-University Medical Center Phoenix, where Pratt was airlifted later that day. "The facial swelling is so immense that even your tongue and lips and the inside of your throat swell," Curry said. "In simple terms, it would be strangulation." Curry's department sees about 70 snake bite patients each year, he said. And while facial bites are rare, men like Pratt who fancy themselves snake charmers are not. 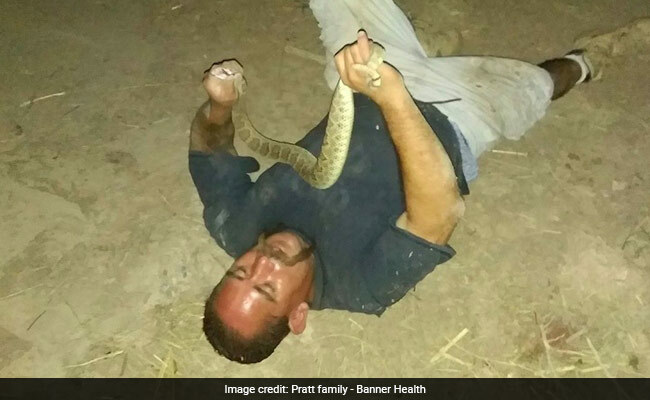 "In my career, and I've been doing this for about 35 years or so, I've only seen one illegitimate snake bite in a woman," he said, meaning a bite in which the victim saw the snake and didn't try to escape. "We find they are far too intelligent to go messing around." He struggled to get his words out through his bloated cheeks, but was not so proud that he couldn't admit a deficiency in his lifelong knowledge of the snake. 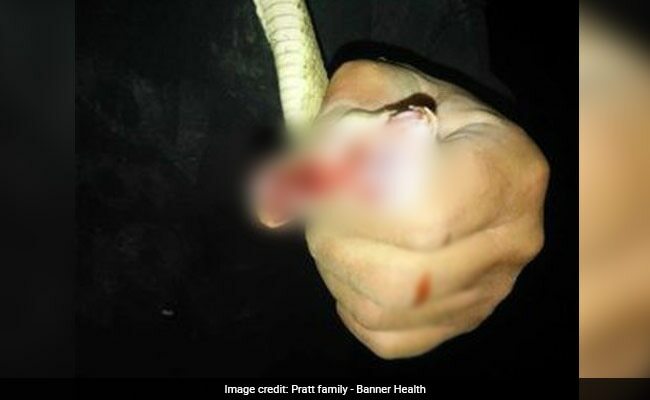 "Think before you go out there and play with rattlesnakes," he told Fox 10 late last week. "You might not make it next time."